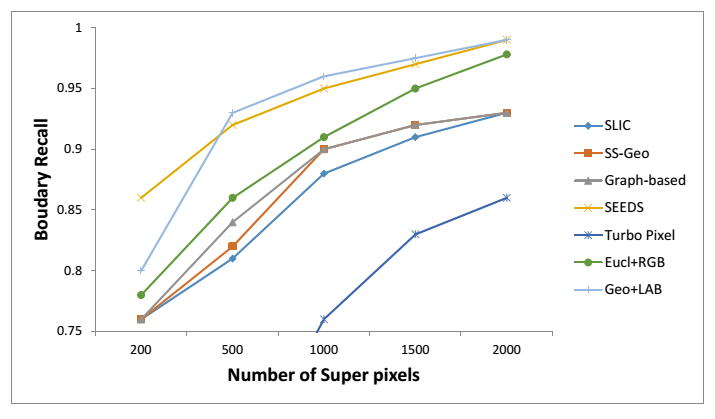 This study presents an efficient superpixel (SP) and supervoxel (SV) extraction method that aims improvements over the state-of-the-art in terms of both accuracy and computational complexity. Segmentation performance is improved through convexity constrained distance utilization, whereas computational efficiency is achieved by replacing complete region processing by a boundary adaptation technique. Starting from the uniformly distributed, rectangular (cubical) equal size (volume) superpixels (supervoxels), region boundaries are iteratively adapted towards object edges. 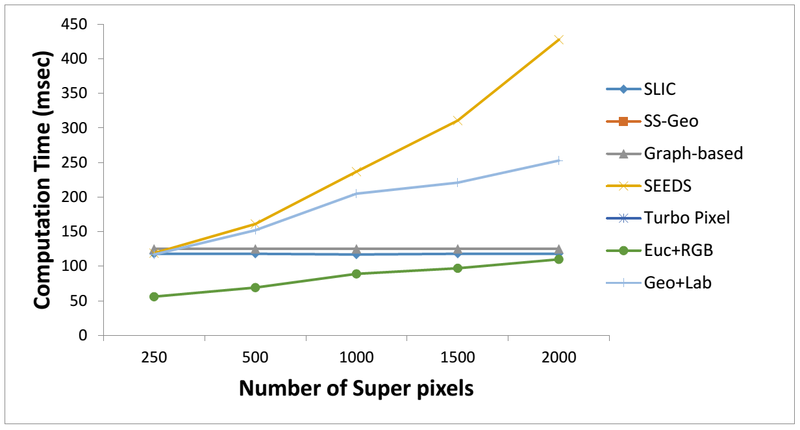 Adaptation is performed by assigning the boundary pixels to the most similar neighboring SPs (SVs). At each iteration, SP (SV) regions are updated; hence, progressively converging to compact pixel groups. Detailed experimental comparisons against the state-of-the-art competing methods validate the performance of the proposed technique considering both accuracy and speed. The proposed algorithmic flow of the method can be explored in four main steps: 1) Initialization of the SPs; 2) SP boundary update; 3) SP structure update; 4) Termination. As an extension of the SP framework along the video, SV extraction has also been implemented and tested. To our best knowledge, there are only limited number of methods presented in the literature for SV extraction. The figure below shows how SVs evolve during the temporal movement. A horizontal slice is extracted from the image and the evolution of pixels in the same location has been observed for the following frames in the video. The zoomed part at the lower side shows the temporal voxel boundaries. One can observe the coherence in the voxel boundaries along the succeeding frames. 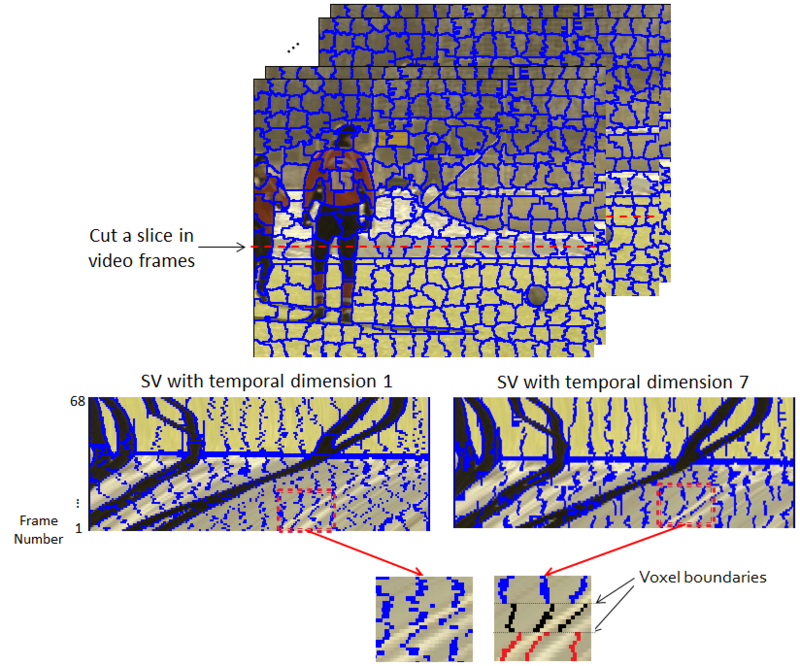 The voxel boundaries can be identified in every 7 frames. Voxels are marked with different colors for visualization.